One of the hottest marketing tactics today is content marketing. According to the content marketing institute content marketing can be thought of as owning your own marketing channel rather than renting it through advertising. The general idea of content marketing is simple: organisations create interesting content which often educates and inspires decision markers, influencers and potential customers. It’s an effective way of winning mindshare and the idea of communicating with your market place by inspiring and educating them, rather than interrupting people with advertising, seems a great idea. 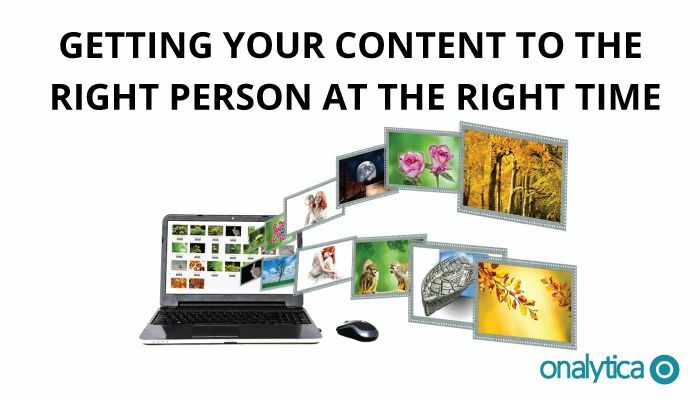 However, in order to get to the point where you can get your content in front of the right people, they have to become aware of you or your content. To achieve this, and then often establish an automatic email-relationship as people will have to register and give up their details to get the content, content marketers use a range of other marketing tactics, especially social sharing and interruption marketing (aka advertising). But what if the content could automatically find its way to the influencers or prospects you are seeking to get the content in front of? And not only that, what if it arrived at the time when it was most likely to be useful to the recipient? Sounds too good to be true? Well, not anymore. With Onalytica IRM our patent-pending process for “reverse content matching” makes it easy (and automated). An example shows how it works: Say you work for an organisation in the Big Data space. You have dozens, hundreds or sometimes, thousands of case studies, white papers, blog posts and Power Point presentations; all of which are available on your website for people to download (if they happen to find them). Just upload all this content to your Onalytica IRM solution, then input your influencers, or let the system determine who the influencers are. Now, every time the influencers (analysts, journalists, bloggers, developers, storage architects, etc.) say something online, on Twitter, in their publication or their blog – or even shares a link on Twitter, this content is matched by Onalytica IRM with your content. Onalytica IRM will now automatically surface what we call “moments of influence”; situations where the influencers in your industry are likely to find a particular piece of your content useful. The evidence is that influencers are not only very thankful when they are alerted to the content, but they start to evangelise it to their network, driving a more viral effect. A key benefit to content marketers is that the distribution and effect of existing content is amplified, with increased ROI on the content marketing tactic as the result.